We’re exactly half-way through 2014. This means that I am also half-way through my New Year’s resolution not to drink alcohol. What an amazing 6 months it’s been. I’m a few pounds below the weight I was striving for, after losing more than 20 pounds this year and exactly 30 pounds overall. I also achieved my lifetime PR (fastest) marathon time already and still have two more on the schedule. And, most importantly, I cannot remember feeling happier, more centered, or more confident. Since this is a major landmark, I finally put some effort into “before and after” photos. Below is a photo that Bruce took of me yesterday, before we left the house for a wedding. Right next to it is a photo taken when I was 20 pounds heavier last Thanksgiving. What I particularly like about the before photo is the ever-present glass of wine. I can see a big difference in my face in the two photos and, upon looking more closely, also in my arms and stomach. For those just tuning in, you can find out more about how I lost twenty pounds here and thirty pounds here. Since I’ve been exercising a lot, I was able to lose the weight without cutting out anything specific except for the alcohol. Although I kept close track of my calorie in-take in order to lose the weight, I wasn’t following a low-carb or a low-fat diet. I ate pretty much what I wanted, but controlled calories through portion size and, if that failed, I exercised more. Speaking of exercise, I have a dramatic set of “before and after” photos of me running. In the first one, I am running a relay race in August last year and I look terribly heavy at 155 pounds. It’s difficult for me to look at this photo and believe that it’s really me. The second photo was taken during a marathon in Phoenix in 2006, when I weighed about 145 pounds. 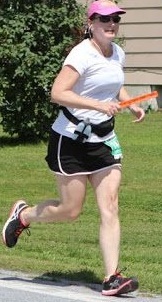 The third photo is from about a month ago at the Vermont City Marathon at my current weight. Just imagine how much more work it was for my legs, my heart, and every other part of my body to run 26.2 miles carrying 20 additional pounds. Over the past month, I’ve grown accustomed to my return to a smaller size. Luckily, I had a few boxes of really nice summer clothes from when we lived in Arizona tucked away in the attic. These things had made the move with us 7 years ago, but never saw the light of day since, until now. I filled up those boxes and more with things from my closet that are now just too baggy to deal with. I also have a pretty good sized pile of other clothes that I plan to take to a tailor sometime soon. Even though I’m still working through my closet to find out what still fits and what doesn’t and what’s salvageable and what isn’t, it’s no longer stressful to think about what I’m going to wear. That’s because I feel great. Analyzing how I feel about myself now, it’s not easy to pinpoint the most important cause. Is it because I’m not drinking? Is it because I have lost so much weight? Is it the buzz I get from running? Or, to quote my friend Camille, is it all of it? Luckily, I have 6 more months to figure that out and also to decide what to do next.